Bodum is famous for creating magic glass vessels for your coffee, and these Bistro 10 oz. Double Wall Coffee Mugs are no exception. Each mug holds 10 ounces of your favorite hot or cold drink. 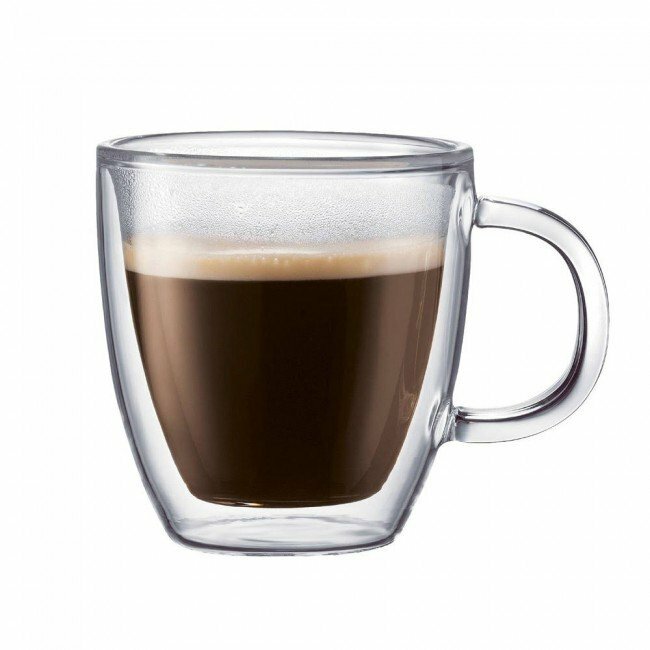 Crafted in strong-yet-ultralight borosilicate glass, this mug is both dishwasher- and microwave-safe, and can be placed on any surface without a coaster. They're so light, you'll swear that you're lifting air, all while keeping your hands safe from the piping espresso goodness inside. Burn Free - These coffee mugs' double-wall design is great as it protects your fingers from getting burned by your piping hot cup of java. Some Like it Hot, Some Like it Cold - These mugs aren't just made for hot drinks, they'll also keep your cold drinks cooler for a longer period of time with the double wall feature. Compared to the average mug these mugs are made of lightweight glass and prevent any burns to your fingers with it's double wall feature.